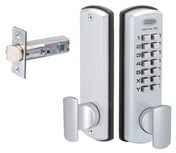 Lockwood Digital 530 Entrance set is a digital Lock. On the inside the internal part of the door there is a turn knob. On the otherside of the door there is a gigital push button key pad. This Lock suits both inward and outward opening doors. The Lockwood Digital DX Lock is keyless and works without any keys. The Lock is function with a 4, 5 or 6 digit code that can be programmed to a series of Letters and Numbers of your choice. This is a mechanical lock therefore no wires need to be installed to make this Lock function. Over the years we have found these Locks installed on Office Doors, Peoples Front doors, Storgage area, Bedroom doors, side access, multi access doors, dock yards, Bathroom Doors, common areas, Studios, Storage Yard, Laundry door, shed door, Kitchen doors and cupboards, Office gates, sales office, meeting rooms, back of house, back doors change rooms, and work sites. The Lockwood Digiatl is available in Satin Chrome Pearl (SP) a matt coloured dull silver finish and Polished Brass (PB) a shinny Gold Colour. The Lockwood Digiatal 530 has a fire rating of up to 2 hours without the rubber gasket on fire doors following the Ausralian Standardsd AS 1905.1: 1997 ,Lockwood Fire Resitant Door set. You can install this lock on a 35 to 45mm thick door. This Lock can be supplied as a double Keypad option if you need a keypad on both sides of a door. This digital Lock is a very popular style Digital Lock and is very common throughout Australia. It is well known and a trusted Lock. It has stainlesss steel springs, a rubber gasket seal that goes around the rim of the lock, 60mm backset and non reversable tumblers. This Lock is great when it is being forced or attempt damage may be caused as the back turning knob has an inbuilt clutching mechanism which allows the know to turn freely without getting caught or jamming up. Remove old key Locks and install a Lock that is all touch button operated.